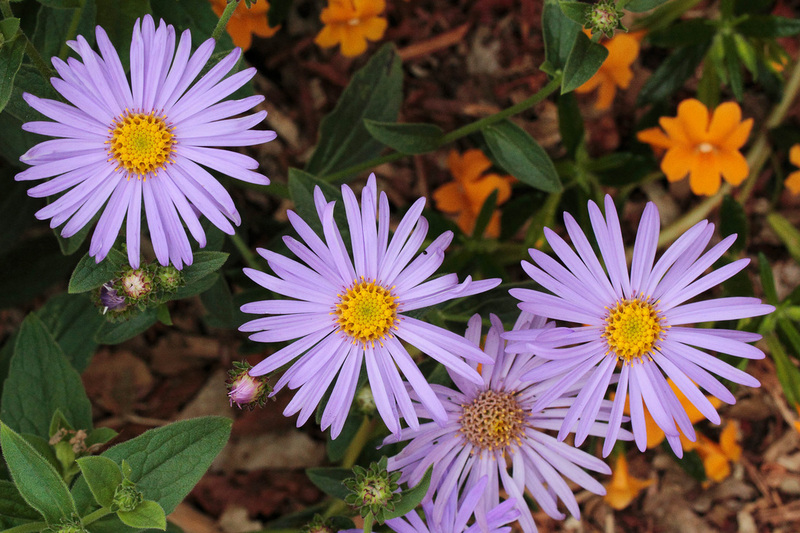 Description: A native evergreen, mostly low-growing perennial, California Aster does well in a variety of soil types in California gardens. Floral heads vary in color depending on cultivar. Some have pale lavender ray flowers; others have blue to light purple ray flowers. 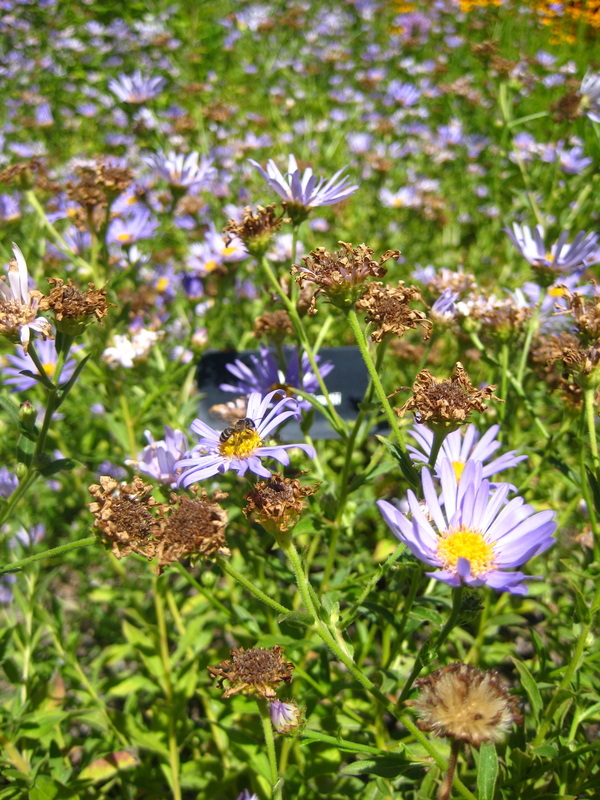 Two cultivars known to be good bee attractors are 'Purple Haze' and 'Point Saint George'. Flowering Season: Summer to early fall, depending on the cultivar. Most Frequent Bee Visitors: Honey bees, Agapostemon texanus, Bombus vosnesenskii, Halictus and Megachile species. Bee Ecology and Behavior: Slow, methodical foraging on flat, open flower heads allows time for good observations. 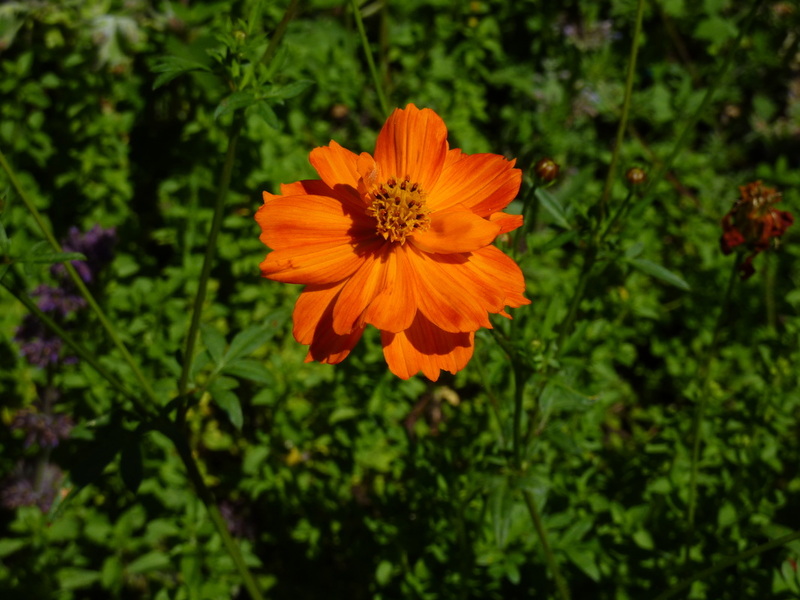 Gardening Tips: In gardens, A. chilensis does well in poor to moderately rich soils, with moderate watering in the summer months, although it can also tolerate dry conditions in gardens that are designed for low water. The species will spread as it ages and some cultivars, such as 'Purple Haze,' spread rapidly through its roots from the original planting, requiring extra maintenance to contain it. It is considered an invasive native species by some horticulturists. 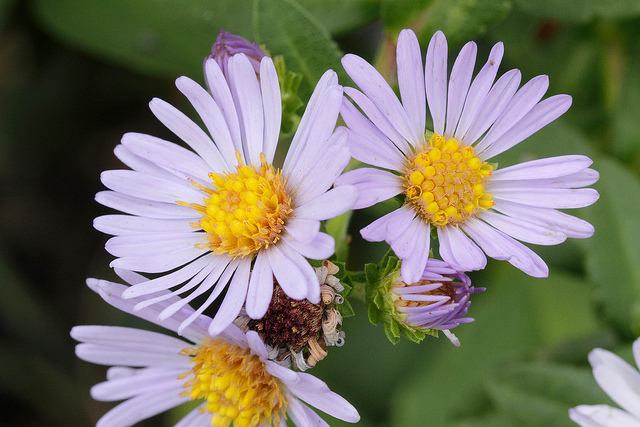 Description: Frikart's Aster is an erect perennial 0.5-0.8m high x 0.3m wide with 5cm wide single floral heads. Ray flowers are lavender to violet blue with yellow disk flowers Three cultivars can be found in most nurseries, and our favorite is 'Monch'. 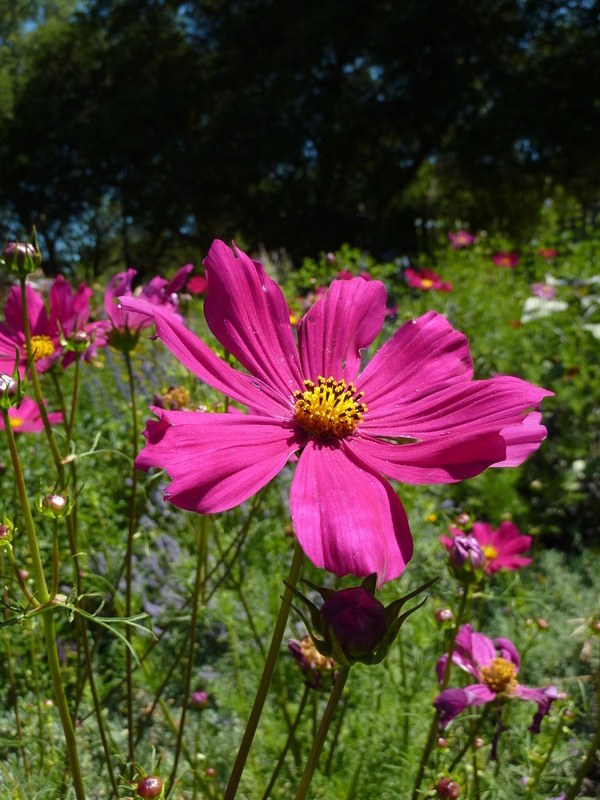 Flowering Season: Summer into early fall, but some flowering will continue all year where winters are mild, for example, in some San Francisco Bay Area cities. Most Frequent Bee Visitors: Megachile, Hylaeus, Halictus, Ceratina, Melissodes species, Xeromelecta californica, Agapostemon texanus, and honey bees. Bee Ecology and Behavior: A wide diversity of bee species consistently visits this plant, foraging for nectar and pollen. Gardening Tips: Grows best in full sun in moderately rich, well-drained soil with summer moisture. Deadheading spent floral heads will extend flowering period. Description: Cosmos is an erect annual with freely-branching, finely divided leaves. 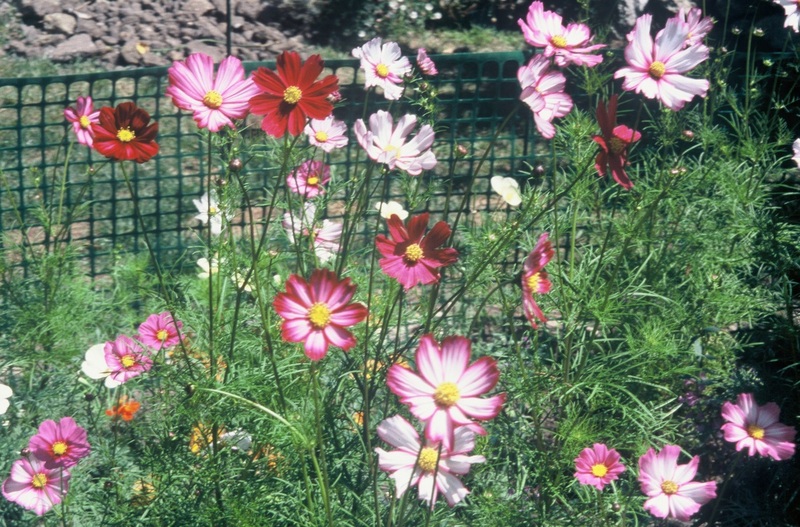 Heights range from 0.3m-2.5m, and flower colors vary between white, pink, lavender and crimson depending on the cultivar, of which there are many. Floral heads are solitary, bowl-, or saucer-shaped and up to 8cm in diameter. Flowering Season: Summer into early fall for most cultivars, depending on when seeds are sown or potted plants transplanted. Spring flowering cultivars such as Sonata series tend not to be attractive to bees. Most Frequent Bee Visitors: A wide variety of bee species, especially Melissodes robustior, Megachile species, and Halictus ligatus. In the Central Valley, it attracts honey bees, Agapostemon texanus, Anthophora urbana, Xeromelecta californica, and Svastra obliqua expurgata. Bee Ecology and Behavior: Male Melissodes often sleep together in floral heads; females much less frequently. During the day, males fly wildly around this and other plant types waiting for opportunities to mate with females coming to floral heads to forage. Gardening Tips: Plants are fast-growing from seeds or transplants in moderately fertile, well-drained, moist soil, and readily reseed. Provide moderate water during summer, cut floral heads regularly at the lowest point on the stems just above the node with the first leaves to prolong blooming. Let some floral heads go to seed at the end of summer for reseeding the following year. 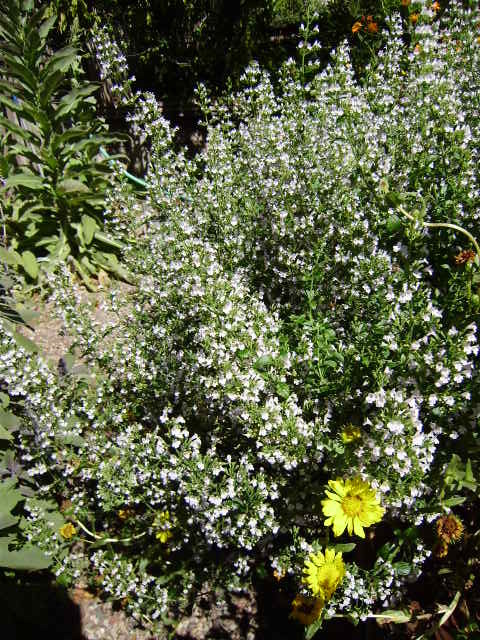 At end of the flowering cycle as the plant is declining, it commonly becomes infected with powdery mildew and the original green lush foliage becomes grey green. Notes: This plant produces showy displays of attractive floral heads, offering important resources for bees for a lengthy period of the growing season. It is an excellent plant for monitoring bees – the pink and crimson floral heads offer best results. The related and less common chocolate Cosmos atrosanguineus Hook Voss has shown little attraction to bees. Description: Sulphur Cosmos is an erect, bushy annual up to 2m in height, with open bowl-shaped floral heads that are 3.5-6cm in diameter and yellow or orange in color depending on the cultivar, of which there are many. Flowering Season: Early summer to early fall (flowering period is a little later than C. bipinnatus). Most Frequent Bee Visitors: Same bee groups as C. bipinnatus. Bee Ecology and Behavior: Melissodes males set up loose territories around plants waiting to mate with females foraging at floral heads. Gardening Tips: Sulphur cosmos is as fast-growing as C. bipinnatus, produces showy flowers that are attractive to bees, and requires the same type of care. Unlike C. bipinnatus, it becomes weedy-looking at the end of growing season. 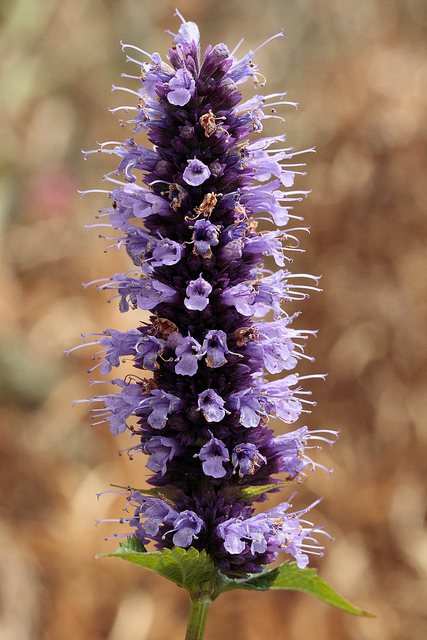 Description: Agastache species are erect, bushy perennials with spike-like inflorescences of long-lasting, 2-lipped tubular flowers borne in whorls. Floral colors vary greatly depending on species and cultivar, of which there are many in the commercial trade. Colors include pink, purple, red, and orange. The long red to orange tubular flowers of many species are best adapted for hummingbird visits, however two species, A. foeniculum and A. rugosa have shorter blue flowers that are especially attractive to some bee groups. Most Frequent Bee Visitors: Bombus and Megachile species, honey bees, Agapostemon texanus, and Coelioxys. 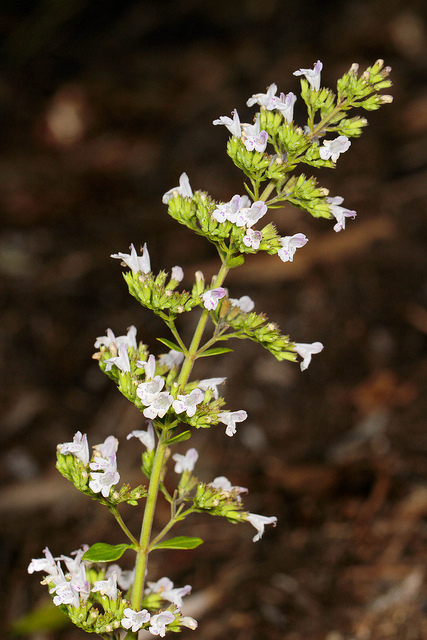 Svastra obliqua expurgata in the Central Valley. Bee Ecology and Behavior: Bee visitors tend to take their time skipping from flower to flower in search of nectar, allowing for observations in close proximity. Gardening Tips: Plant in full sun in well-drained soil and water occasionally through flowering period. Deadhead and cut back vegetative growth to renew foliage and extend flowering. Description: Clinopodium nepeta is an erect perennial up to 0.7m high with stout stems that bear dense displays of pink or mauve flowers. It is strongly but pleasantly aromatic, blooms for a lengthy period in the growing season, and is highly attractive to honey bees. Flowering Season: Summer to early fall. Most Frequent Bee Visitors: Honey bees, Megachile species, Ceratina species, and Anthidium manicatum. Bee Ecology and Behavior: Honey bees are almost always found in great abundance on these flowers, and they forage calmly, moving in short flights between flowers. Males of Anthidium manicatum patrol their “territories” among the flowers looking for females and occasionally succeed in initiating mating on the flowers. Gardening Tips: Plant in well-drained, moderately rich soils in full or partial shade, with some summer moisture. Spreads slowly by rhizomes, however it is not invasive. Cut back in early winter. Notes: Large numbers of flowers are continually produced during the growing season, which makes this plant constantly and consistently attractive to bees. It is one of the most attractive honey bee plants in urban California. Description: Caryopteris ×clandonensis 'Blue Mist' and C. incana (Common bluebeard) are two Caryopteris species that are used in California gardens. Caryopteris ×clandonensis is a hybrid between C. incana and C. mongholica. 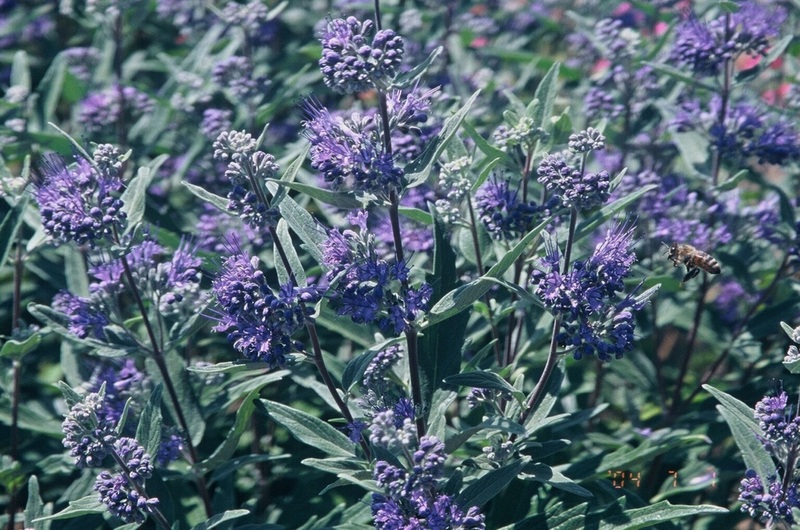 The two ornamentals are small deciduous shrubs with small blue to purple flowers borne in clusters along terminal stems. Flowering Season: Midsummer to early fall. Resource for Bees: Mostly nectar. Most Frequent Bee Visitors: Honey bees, Megachile species, Anthophora urbana, Halictus ligatus, Hylaeus mesillae, and Lassioglossum tegularforme. Bee Ecology and Behavior: Caryopteris species are good nectar sources for a variety of late-season native bees. They should be regular components of a habitat garden. Gardening Tips: Both ornamental species thrive in well-drained loamy soil in full sun, and need moderate watering in summer. Deadhead clusters of spent flowers to extend flowering. Prune moderately in winter or early spring to woody base.